Galactic Unite was created with the foundation of inspiring imagination in the next generation to solve real world problems in science and technology. My name is Kyle Schubert and I am one of those inspired individuals. I am an aspiring aerospace engineer currently studying at San Diego State University. I was one of the recipients of the Galactic Unite Borden Scholarship for my interest in space exploration and in relation to my field of study. Galactic Unite has given me the opportunity to further my interest in space and imagine the next iteration of rockets and spacecraft. About six years ago my father went to Oshkosh, Wisconsin and saw WhiteKnightTwo on display at the EAA AirVenture. When he came back he told me about Virgin Galactic and gave me a T-shirt with Spaceshiptwo and WhiteKnightTwo mated on the front – I wore that shirt for three days straight, it was awesome. After I found out more about Virgin Galactic and what they do I was intrigued by the idea and thought to myself, “If I had the opportunity I would like to be a part of that”. Fast forward to 2014 when I heard that there was a scholarship being organised at my University by Galactic Unite. The Scholarship was funded by Scott Borden, a Virgin Galactic Future Astronaut that will be flying to space on board Virgin Galactic’s SpaceShipTwo when it is ready for commercial flight. He was intent on finding students that were actively participating in space-related interests, such as the SDSU Rocket Project – we also needed to have good academic standing. I was an active member of the Rocket Project and I decided to apply, hoping that I could obtain the scholarship and a Virgin Galactic mentor. I could not believe it when Scott Borden handed me the paper to sign my name and receive the scholarship. I couldn’t even imagine that an organisation that I have been heavily following since before I went to college, was taking notice of me. After I received my scholarship I spent time getting to know my new Virgin Galactic mentor, Marissa Good – we immediately connected, and learned so much about each other and how similar we were. 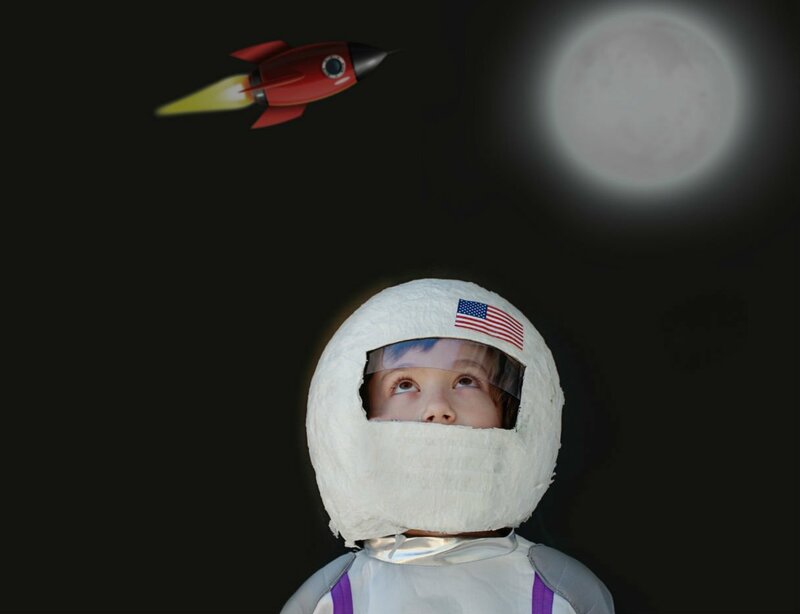 We talked about everything ranging from space simulators to our imagination as kids that we would one day be in space. I was thrilled to get to know someone that loves space and spaceflight as much as I do. Marissa helped me tremendously by sharing her experience in dealing with the exact same problems we were having in the development of our rocket, which the Rocket Project was having. One thing that she suggested was how to safely deflect liquid oxygen during our cryogenic test. When I received the scholarship in the early fall of 2014 it was right back to work on the newly named SDSU Rocket “Galactic Aztec”, which was named in thanks to Galactic Unite for supporting the Rocket Project. We had just a few months to prepare for the static test of our rocket. After the successful static test in November we pushed on forward to launching our rocket in April of 2015. To show his support, Scott Borden came to our build meetings a few times to see the progress of our rocket and he motivated the troops to keep persevering. He wished us good luck to a successful launch of the Galactic Aztec. April 18th 2015 was a fantastic day to launch our rocket. It was amazing to see so many people working as a team to bring this rocket together with the support of Galactic Unite. Lots of Virgin Galactic employees even came out to our launch to see what the Rocket Project was made of! And we did not disappoint, achieving an altitude of 12,000 feet with our 23 foot tall rocket. 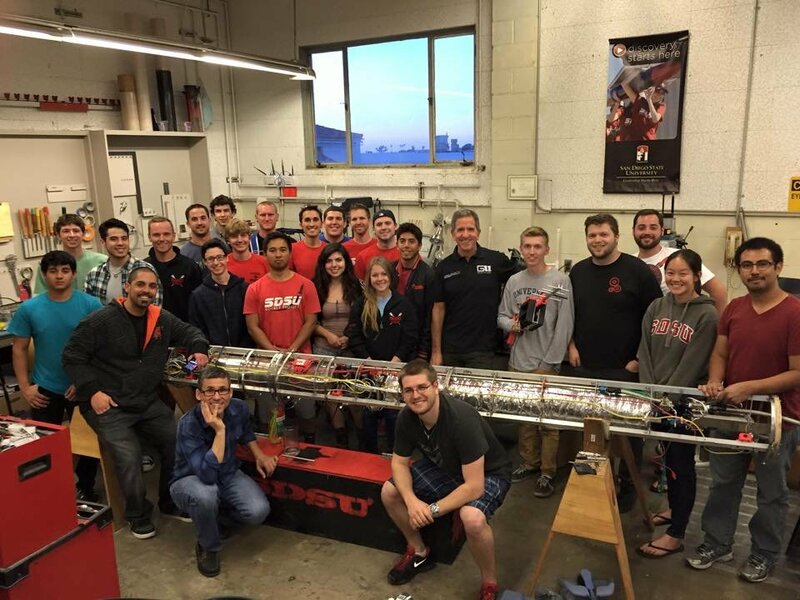 It was the most complex and innovative rocket that the SDSU Rocket Project had ever launched. When the launch weekend ended it was such a relief to know that so many hours of our hard work, and months of planning had finally paid off. But the excitement didn’t stop there. Virgin Galactic and Rocket Project had been talking about a potential tour at their hangar and manufacturing facility TSC for some time, and when it came about in May that year, I was hugely excited to take part. On Sunday May 3rd we began driving to the Mojave Air and Space Port. The entire drive I was exhilarated to be going to see the WhiteKnightTwo that my father had shown me pictures of. When we arrived, the Virgin Galactic members thanked everyone for making the drive up to Mojave and began to describe what Virgin Galactic is all about. I can’t tell you how many times I have seen the videos that they showed us of SpaceShipTwo’s powered flights and testimonies from their employees about Virgin, but I was still fascinated. After, we began the tour. My heart began to race as we approached the doors where I knew WhiteKnightTwo and SpaceShipTwo were behind. When the doors finally opened, I was star-struck – it was like meeting a rock star, mixed with seeing the Empire State building for the first time. It was a dream come true to see both vehicles and the facilities that are being used to create the future of human spaceflight. Throughout this entire experience of being a Galactic Unite Scholar and Rocket Project member I have been absolutely inspired by the potential future of human spaceflight and my place in it. If I was ever given the opportunity to participate in this amazing adventure of spaceflight I will do so in a heartbeat. I have wanted to get people inspired by space my entire life, and Galactic Unite has given me a way to further that goal. If you would like the opportunity to study STEM education and become a Galactic Unite scholar, take a look at the scholarships available. Good luck!